Three Maine men stand accused of some slimy fishing in the Absecon Creek near Atlantic City, according to authorities Friday in announcing a grand jury indictment for allegedly trapping 24,000 undersized eels that are a delicacy in Japan. Dale Witham, 55, of Medomak, Robert Royce, 63, of West Rockport, and Neal Kennedy, 53, of Thomaston, were indicted last week after the N.J. Department of Environmental Protection first arrested them March 17. Conservation officers first discovered illegal "fyke nets" set in a section of Absecon Creek on property belonging to the Atlantic City Municipal Authority March 12. Early the next morning, about 2:30 a.m. March 13, the officers allegedly found the three suspects remove the nets and take the catch into a van. They pulled them over on Route 30 and found numerous "elvers," or juvenile American eels, according to the Atlantic County Prosecutor's Office in a release Friday. American eels measuring less than six inches are illegal to possess in New Jersey. The fyke nets they were also allegedly in possession of at the time are also illegal under state Fish and Wildlife laws because they were made of a fine mesh with holes measuring less then 3/8 of an inch in size. Conservation officers then inspected a pickup truck belonging to Royce parked outside the Red Carpet Inn where the men were staying and allegedly found a huge quanity of the elvers. The total quantity of elvers weighed nearly 10 pounds and consisted of over 24,000 eels, the county prosecutor's office said. According to the state Division of Fish and Wildlife, American Eels are considered a delicacy in Asia and sell on the black market for $1,600 to $2,600 per pound. "The American Eel is important to NJ, both ecologically and economically. New Jersey along with every other state bordering the Atlantic Coast, with the exception Maine and South Carolina, has regulations enacted to protect this life stage (referred to as elver or glass eel) of the American Eel," Division of Fish and Wildlife Capt. Dominick Fresco said in a statement. 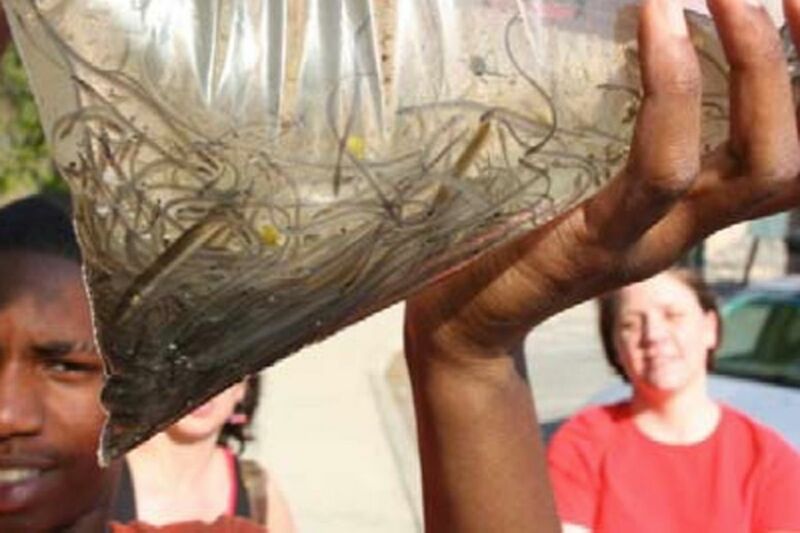 "Elvers are extremely vulnerable to capture as they leave the Atlantic Ocean and concentrate in freshwater creeks. The illegal harvest and black market trade of elvers has created enforcement issues and challenges in many of these states," Fresco added. The men were initially charged with trespassing and Fish and Wildlife summonses, but last week were indicted on conspiracy to commit theft, criminal trespass and unlawful possession of wildlife for the purpose of sale, all third-degree crimes. Third-degree crimes carry the potential of three to five years in prison and up to $15,000 in fines.